Our first beneficiary Patrick wins award!!! We are incredibly pleased and proud to announce that Patrick, our very first beneficiary, has won this year’s Lammy Award for Innovation. Patrick received the award for making a difference to the lives of blind and partially sighted people in Lambeth by piloting technology training courses at job centre plus. Patrick is taking a leading role by working in partnership with Job Centre Plus Streatham and Streatham Tate Library. We are really delighted and honoured that Usha Stevens has decided to undertake this incredible challenge to raise as much money as she can for JSF. During a two month period, starting in September, Usha plans to complete FOUR running events. Usha completed a 10 mile run last year, but has not run a half marathon before. So the first event, will be her first ever half marathon!! We wish Usha all the very best of luck and urge you to support her in this “crazy” challenge. We are honoured and delighted that, for a second successive year, the staff and students at Pankhurst House, Surbiton High School (SHS) have raised so much money for JSF. Throughout the academic year, they have baked cakes, held Raise and Give (RAG) activities, created school sports, drama, and music completion. worn mufti, played a 12- hour Hockathon and, most impressively, held a two-night Fashion Show. This is an impressive amount of money that will really help to make a difference. Congratulations to Hayley and Team Opia on completing the Tough Mudder challenge on April 29th and raising £177 for JSF. The team waded through 5 miles of mud, with 13 obstacles. Well done team and thank you!! Congratulations to Daniel Ralph for his heroic effort in completing the Virgin Money London Marathon and raising a spectacular £3,576 for JSF. This was an incredible challenge for Daniel. Not only was it his first ever marathon but also, after his knee gave out after 2 miles, he refused to give up and somehow managed to drag himself along the next 24 miles to reach the finishing line. But he did it, and for that he really deserves that medal and even more support – there is still time to sponsor Daniel. 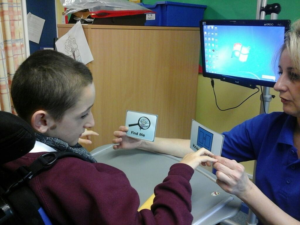 Also a very special thanks to Phillip Anthony and staff of Co-Operative Systems who made a significant donation to sponsor Daniel and help him meet his target. Thank you Daniel and thank you to everyone who sponsored him. Thank you Phil for your heroic effort!!! Phil has raised £454 so far but please sponsor him to help him reach his £800 target. He deserves it!! A very special thank you to Zayan who donated £30 of his hard earned pocket money so that he can help to make a difference. We are very touched by such a sweet, thoughtful and generous gesture from one so young!! Daniel Ralph’s training is coming along well, but he has a long way to go!! This is Daniel’s first ever marathon and it is a tough challenge. He has agreed to raise a minimum of £3,000 for the Janki Saye Foundation and he really needs your support and encouragement to achieve his target. George is 11 years old. He has cerebral palsy, severe learning difficulties and epilepsy. He is wheelchair bound, unable to talk and relies on his mother for his basic everyday needs. At his school, 3 days a week., George has access to an EyeGaze system with skills development software. With this system, he uses his eyes to control the activities. Staff have found that he really enjoys these sessions. 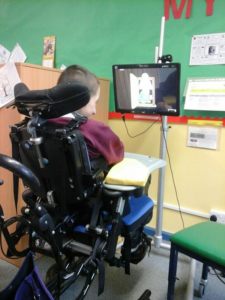 George’s family are very keen to for him to be able to practice these activities at home so that he can advance his learning and also use the EyeGaze system to communicate with them. Please sponsor Daniel and help him to raise the money needed to help George. Daniel Ralph is braving the cold winter mornings to train for his first ever marathon in order to raise a minimum of £3,000 for the Janki Saye Foundation. This is a tough challenge and Daniel will need all the help he can to reach his target, so please show your support and sponsor him today!